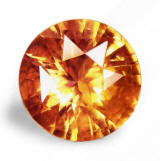 Hessonite garnet or "Gomed" in Sanskrit & Hindi is the Jyotish gem related to Rahu (Moon's ascending node), which is mainly an elemental and instinctual entity. When badly positioned, this "shadow planet" is characterized by insatiable worldly recognitions and desires together with sense gratification. Wearing a hessonite of at least 2 carats is said to calm the senses, bring success, wealth and notoriety in society, increase life span and good fortune. Hessonite can be substituted with orange zircon. If you want to know more about the gemological, astrological and healing properties of hessonite Gomed, click here. Important: Important: The following pictures are highly magnified (30X) and do not show the gems' real size. Color and brilliance can greatly vary from computer to computer, depending on your monitor's settings. Color will also, naturally, vary from sunlight to indoor, incandescent light. Dark and lighter areas are effects from the digital camera. See description for accuracy on clarity grade, color and exact dimensions in mm. 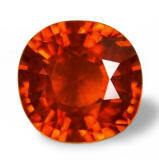 Hessonite garnet is never treated. 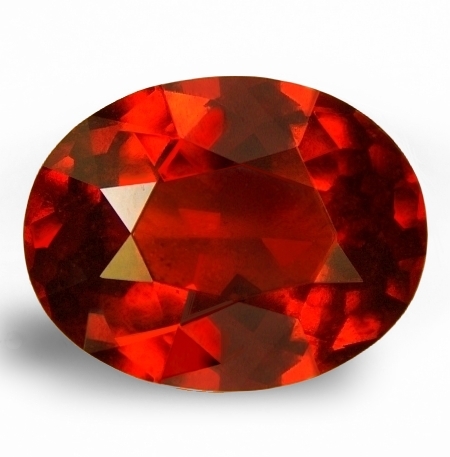 Radiant, perfectly cut, Ceylon hessonite garnet for Vedic astrology. $100/ct $329/gem Beautiful one. 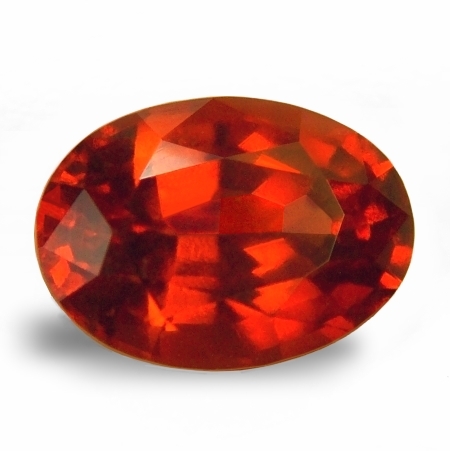 This Ceylon hessonite garnet weighs 3.29 cts., finest "cinnamon' color (medium-dark, burnt orange), perfectly executed, oval, mixed cut, and measuring 10.00 x 7.37 x 5.77mm, eye flawless, VVS2 in clarity, from the gem fields of Nivitigala, cut & polished in Beruwela, Sri Lanka. We cherry pick all of our untreated gemstones to be used for Vedic astrology and Jyotish among thousands at the trading and mining centers around the world. For clean clarity, perfect cut, maximum luster & brilliance and a sweet, auspicious feel. You have finally found the right source. Super lustrous, clean and well cut, Ceylon hessonite garnet for Vedic astrology or Jyotish. $90/ct $205/gem This untreated, Ceylon hessonite garnet, (called also Gomed) weighs 2.28 cts., medium, pastel, golden orange color, masterly executed, oval, flower cut, and measuring 8.69 x 7.90 x 4.90mm, eye flawless, VVS1 in clarity, super clean crystal from the already depleted mines of Kataragama, Moneragala District, Sri Lanka. 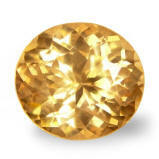 This golden-peachy variety of hessonite is not longer mined, and what is left on the market is old stock. This one will not fail to impress, with its perfect cut & flawless clarity, that result in awesome luster and auspicious feel. 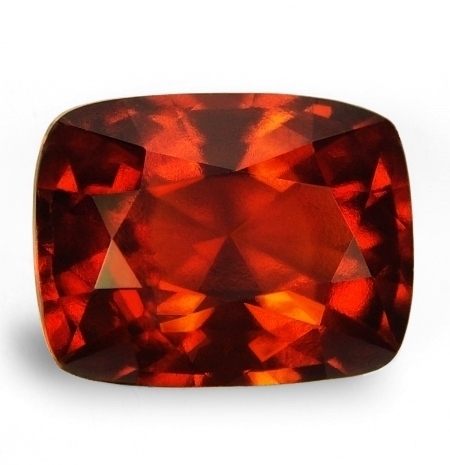 Absolutely gorgeous, perfect cut, color and clarity, Ceylon hessonite garnet. $100/ct $374/gem Once in a while we come across some perfect gems. Perfection is a rare occurrence. This is the case with this Ceylon, Vedic hessonite gomed, that weighs 3.74 cts., finest "cinnamon' color (medium-dark, burnt orange), perfectly executed, antique cushion, mixed cut, and measuring 9.52 x 9.05 x 5.58mm, flawless gem, IF-VVS1 in clarity, perfectly clean, from the gem fields of Nivitigala, cut & polished in Ratnapura, Sri Lanka. A most beautiful, auspicious, finest flawless clarity with ideal cinnamon color and marvelous cut, untreated, Vedic hessonite garnet up for grasp. Perfection at a great price. Gorgeous color in this well cut, clean, and definitely spell-binding, Ceylon hessonite garnet. $100/ct $350/gem What a color! This fine, Ceylon hessonite garnet weighs 3.50 cts., finest "cinnamon" color (medium-dark, "burnt" orange), marvelously executed, oval, mixed cut, and measuring 9.97 x 7.43 x 6.34mm, eye flawless, VVS2 in clarity type2, from the gem fields of Nivitigala, cut & polished in Beruwela, Sri Lanka. Cut to perfection and with wondrous color that translate in a vivid orange fire, this untreated hessonite is sure to attract the benevolence of Rahu in your life. Seductive, well shaped & super clean, untreated, Ceylon hessonite garnet for Jyotish & Vedic astrology. $85/ct $189/gem A very lovely, untreated, Ceylon hessonite garnet for Jyotish & Vedic astrology, this one weighs 2.22 cts., medium, brownish, burnt-orange color (medium cinnamon color), well executed, antique cushion, mixed cut, measuring 7.91 x 6.83 x 4.82mm, eye flawless, VVS2 type2 in clarity, mined in the Nivitigala area, cut & polished in Beruwela, Sri Lanka. Nicely shaped and very clean, this is a great deal for somebody on a budget and still wanting a favorable Rahu gemstone for Jyotish purposes. Astrological pendant talisman for Vedic hessonite gomed. Set yourself apart. Our ultimate goal is to create powerful, well balanced & beautiful astrological talismans for Vedic astrology. 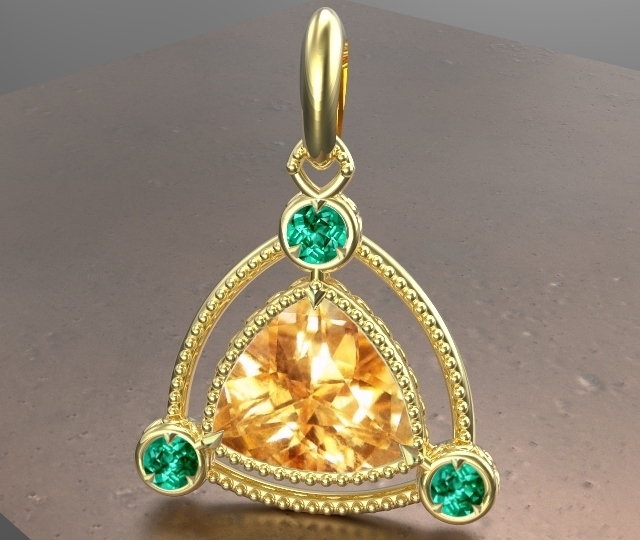 What about this Hessonite and Colombian emeralds pendant? All of our talismans are hand crafted to perfection, and we always strive to give everyone something that is personalized & unique. Every custom piece, even though follows the main design, will have invariably something unique & different from the previous (be size of granulation, slightly different spacing, 1 tier or two tiers around center gem, etc.). Can do it in any color gold, yellow, white or rose. And can do it for any size hessonite. Set your self apart. Beautifully resplendent, perfectly cut, untreated, Ceylon hessonite garnet. $100/ct $196/gem Brilliant and with a hot color, this untreated, Ceylon hessonite weighs 1.96 cts., medium, super bright, burnt orange color, perfectly executed, round flower cut, and measuring 7.96mm in diameter x 4.74mm deep, eye flawless,VVS2 in clarity, from the gem fields of Nivitigala, cut and polished in Ratnapura, Sri Lanka. 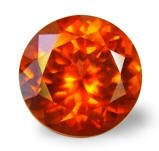 Beautiful hessonite with the color of molten lava, that has great luster and exotic eye appeal. Good price too for this color and clarity and calibrated 8mm round shape. Will set beautifully. Sweet, well cut and clean, untreated, Ceylon hessonite garnet. Low price. $100/ct $236/gem A real sweet, untreated, Ceylon hessonite garnet, weighting 2.36 cts., medium to medium-dark, burnt reddish-orange, well executed, antique cushion, mixed cut, and measuring 8.22 x 8.18 x 4.68mm, eye flawless, VVS2 in clarity, from the gem fields of Marapana, cut and polished in Ratnapura, Sri Lanka. 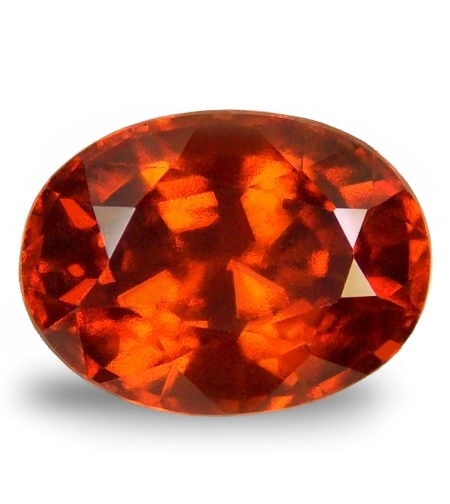 A very lovely, completely untreated, Ceylon hessonite garnet with fine color, clarity and awesome cutting. A good hessonite gomed to propitiate the favors of Rahu in your life. Auspicious, well cut & clean, untreated, "cinnamon" color, Ceylon hessonite garnet. 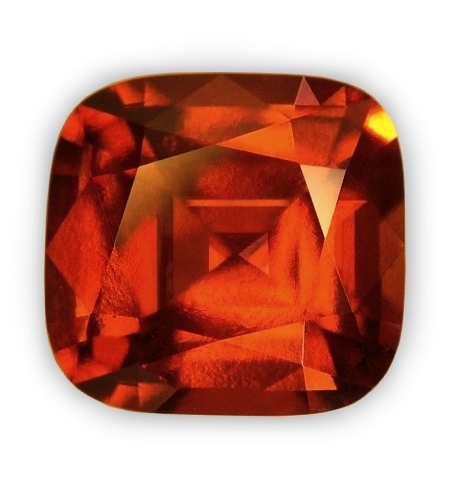 Mysteriously enticing, this old stock, untreated hessonite garnet (called "gomed" in Jyotish astrology) weights 2.50 cts., good, "cinnamon", burnt brown- orange color, perfectly executed, "antique" cushion, mixed cut, and measuring 8.80 x 7.53 x 4.68mm, eye flawless, VVS1 from the gem fields of Ratnapura, Sri Lanka. We only choose the cleanest and well cut, Ceylon hessonites available. Not an easy task, if you consider that hessonite garnet is a gem variety borderlining type3, which means "always included". Rest assured that our hessonite gomedas are astrologically auspicious & beautiful to the eye. Imposing, large size, definitely auspicious, untreated, Ceylon hessonite gomed. 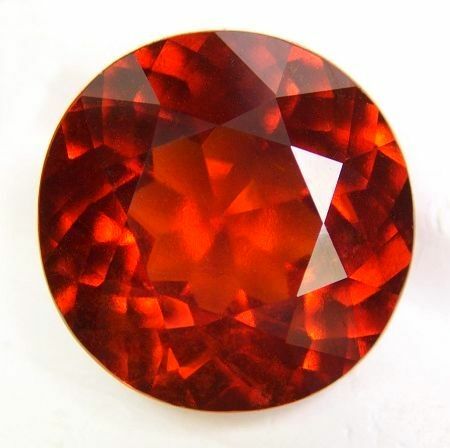 $110/ct $824/gem Large size, Ceylon hessonite garnet, it hits the scale at 7.49 cts., medium-dark, fine "cinnamon" color, well executed, oval, mixed cut, and measuring 14.00 x 10.97 x 6.53mm, eye flawless, VVS2 in clarity, from the gem fields of Balangoda, Sri Lanka. 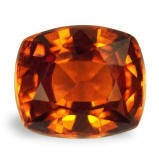 Imposing presence, this is a great hessonite of conspicuous size. By buying at the source, at the gem mining sites in Sri Lanka, we are able to cherry pick, the most auspicious, well cut and clean Vedic gemstones for Jyotish astrology at the lowest wholesale prices. You have finally found the source. Alluring, well shaped, definitely masculine, untreated, Ceylon hessonite gomed. $100/ct $391/gem A real nice Ceylon hessonite garnet or gomed, weighting 3.91 cts., fine, medium-dark "cinnamon" color, very well executed, "antique" cushion, mixed cut, and measuring 10.34 x 8.2 x 5.52mm, eye flawless, VVS2 (super clean), from unknown gem mining location, Sri Lanka. Beautifully shaped, definitely masculine, this one has a special allure and energy. Ideal for a on-of-a-kind gent's ring. Priced well. Our best. Absolutely incredible, truly spectacular, huge, untreated, Ceylon hessonite garnet. $150/ct $2,353/gem Well, you have to see this hessonite in real life. The pic simply does not do any justice to this imposing & stunning gem. It weights 15.69 cts., medium-dark, hot "cinnamon-orange" color, perfectly & masterfully executed, round, "flower" cut, and measuring 16.00 x 16.50 x 8.72mm, eye flawless, VVS2 (super clean) in clarity, from the gem fields of Kuruvita, Sri Lanka. Trust me, one of the most beautiful hessonite we had the privilege to acquired. Large face, facing up like a 25 cts. stone, no bottom, yet, no window, the color of the burnt lava, superb clarity for this large size. Will mount royal. An unique gem for a special person. Resplendent, superbly cut, gorgeous color, untreated, Ceylon hessonite garnet. For a special person. Staggering & very beautiful, Ceylon, orange-golden hessonite garnet this one, weighting 5.89 cts., medium, vivid, orange with golden undertones (amber color), masterly executed, round "flower" cut, and measuring 12.00mm in diameter x 6.52mm deep, VVS2 in clarity, very clean material, from the already depleted gem fields of Kataragama, Sri Lanka. One of those gems that need no words. 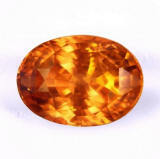 Great clarity (which is rare in a hessonite), very large face, more like a 9+ cts. stone (not weight on bottom), fine color for this orange peachy variety. Resplendent like a Sun. Very fine quality, beautiful gemstone. 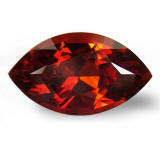 Superbly flawless, finely cut, definitely beautiful, untreated, Ceylon hessonite garnet. What a gorgeous hessonite gomed here. It weights 2.81 cts., medium, "imperial" golden-orange color, perfectly executed, oval, "flower" cut, and measuring 10.00 x 7.78 x 5.17mm, superbly flawless, IF-VVS1 in clarity, from the Kataragama mines, Sri Lanka. Possessing an awesome feel, this is a stone guarantee to enhance the Rahu energy and favors in your life. As good as it gets. We cherry picked form an old, friend miner's parcel of about 75 stones, and we picked 5 of them. The most flawless and well cut. Only with us, and of course at the lowest, wholesale prices for the quality we carry. Absolutely gorgeous, big size, rare Ceylon, orange-golden hessonite garnet. Superb luster. One of the most beautiful, Ceylon hessonites we have on hand right now. Conspicuous in size, this gem weights 11.22 cts., medium, orange color with golden undertones, masterly executed, oval, mixed cut, and measuring 14.73 x 10.73 x 9.15mm, eye flawless, VVS2 from the gem fields of Kataragama, Sri Lanka. Old stock from a Sri Lankan friend, this gem has been re-cut to perfection from an originally 14.68 cts. in weight. This particular color is only found in Sri Lanka, & specifically in Kataragama, but the mines there have not produced significant gem quality rough material since 2006. What is left are older stock stones here & there. We are proud to offer such beautiful specimen. Very uniquely shaped, flawless, untreated, "cinnamon" Ceylon hessonite garnet. Simply gorgeous. What an unique & gorgeous hessonite garnet. 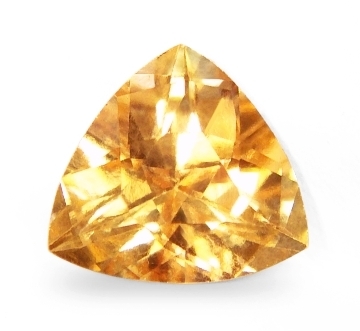 It weights a great 8.39 cts., finest "cinnamon" color, masterly & uniquely executed in a marquise, mixed cut shape, and measuring 17.63 x 10.19 x 7.16mm, absolutely flawless, super rare clarity, IF-VVS1 from the gem fields of Ratnapura, Sri Lanka. 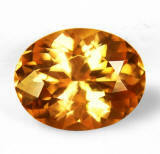 Hessonite garnet is a type2 gemstone, however borderlining the type3, which means that it is usually always included, both in the lighter variety and in the dark cinnamon color. To find flawless hessonites is just a very rare occurrence. Here is your chance to get a completely clean, perfectly & uniquely cut hessonite of impressive eye appeal. Real nice. Very sweet, completely flawless, peachy-orange, Ceylon hessonite garnet. Beautiful. 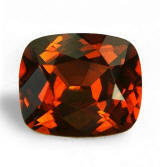 A very cute, Ceylon hessonite garnet that is priced well. 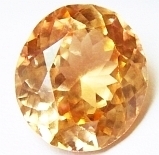 This beauty weights 2.58 ct., medium, pastel, golden-orange color, excellent, oval, flower cut measuring 9.2x8.3x4.75mm, eye flawless, VVS1 type2 from Sri Lanka. With the mine exhausted of quality gems, the little available on the market of this very rare variety is appreciating by the week. This is an old stock with the affordable price. And the gem is well worth it! Great brilliant gem. Magical & definitely auspicious, very well cut and super clean, Ceylon "imperial" hessonite garnet. Beautiful one. A real special hessonite, this one weighting 2.63 cts., medium, pastel, golden-orange color, masterly executed, trillion mixed cut, and measuring 8.88x9.58x5.39mm, eye flawless, VVS1 in clarity, super clan crystal, from the Kataragama mine, Moneragala District, Sri Lanka. The lighter "peachy-orange" variety of hessonite, only found in Sri Lanka is a rather beautiful gemstone. Most of the time, heavily included, borderlining the type3 gemstones like emeralds and rubellite tourmalines, and nowadays completely mined out. This one has top flawless clarity, superbly perfect cut and an overall spirit-uplifting feel. Simply perfect.